Any one that knows me or has heard my testimony knows that I’m all about grace and mercy. I will never understand why a holy God would extend to me this awesome love. I know that it is by his grace, through the faith that he gives us as a gift, that we have been and are being saved. However, we have to understand that being in relationship with God also involves (I’m gonna say it) WORKS. This portion of scripture troubles a lot of people as they see it in opposition to being saved by grace through faith. I believe that in this passage James is showing us wh at real faith looks like. True saving faith involves more than just an acknowledgement of the gospel’s claims concerning Jesus. Even the foulest demon of hell believes that Jesus is the Son of God. What a travesty it is that America is filled with folks who believe that they are in Christ because they were sprinkled as babies or 20 years ago walked some aisle and shook a preachers hand and said, “I believe.” Their relationship with sin has never changed, they look and act no different from the world, and yet they believe that all is well. We have done a great injustice for which we will be held accountable if we do not seek to correct this faulty understanding of saving faith. Faith that is real is faith in action. When you truly believe, there will be corresponding works that attest to the validity of your faith. 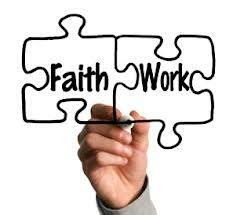 Authentic belief (faith) is always accompanied by a tangible response (works). James points out the fact that Abraham’s faith was proven to be real by the things he did. He did not merely profess belief in God; he obeyed him by not withholding Isaac. Rahab the prostitute demonstrated her belief in God by her actions. The truth is that we can say anything, but who we are is ultimately revealed by what we do. If a man tells his wife that he loves her, but doesn’t speak to her, hold her, kiss her, protect her, or in any way demonstrate his professed love; would she be inclined to believe that his love for her is real? Even so, if we say we have faith in God, but live the same way we did before we came to faith, if we never speak to him, serve him, or in any way demonstrate the faith we say we have; is there any reason to believe we truly have faith? We are saved by God’s grace, apart from anything we could ever do. Our salvation is a result of a loving God extending faith, grace, and mercy to us in Jesus. We can’t do anything to deserve God’s grace and the faith we have is given to us by God. But James reminds us that the one who possesses the real deal will be one whose life demonstrates its reality by the things he does.